A major waterways project is being promoted to encourage riverside development in Lincolnshire. The £30m plan calls for new stretches of canal, better bridges and improved flood defence facilities. The knock-on effects would include a stable water level and access to other canals and rivers in the region. Described as Lincolnshire's answer to the Broads, the Fens Waterways Link would eventually connect Boston with Lincoln, Spalding and Ely. Barry Higham from Boston Borough Council said: "The Fens have more mileage of water in them than the Norfolk Broads yet we are not seen as a tourist destination for riverboat users. 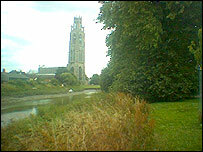 The project would include a link between the South Forty Foot Drain and the River Witham in the Boston area. The scheme - described by the Environment Agency as the biggest waterway enhancement project in Europe - would open up 240 km of waterway. The project would include tidal control work, dredging, and restoration of locks and bridges, bringing a tenfold increase in the number of boats using the waterway. "The potential to have more river-borne tourists stopping (in Lincolnshire) is absolutely great - this way we can bring in visitors that is sustainable," Mr Higham said. "Boston has turned its back on the river in the past century when it was a thriving port - we need to take this opportunity to open up the river again." He said the project combines flood defence for the area with navigation. John Adams from the Environment Agency said the project is "the most exciting new waterway project in the UK for two centuries". "It will complete the inland navigation system by joining our eastern rivers to the rest of the network," he said. The application will be considered by the Boston Borough Council in September.